Exposure to newspaper ads is largely driven by its position in the paper. Size and colour mainly determine ad noting and brand awareness. Ad read is determined by colour, brand usage, type of ad - action ads (those with a sense of urgency) are read more - and how well liked the ad is. Readers have an impact on ad effectiveness. 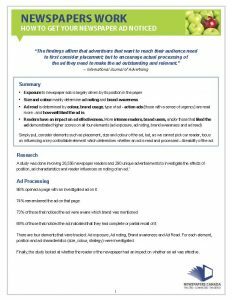 More intense readers, brand users, and/or those that liked the ad demonstrated higher scores on all four elements (ad exposure, ad noting, brand awareness and ad read). Simply put, consider elements such as placement, size and colour of the ad, but, as we cannot pick our reader, focus on influencing a key controllable element which determines whether an ad is read and processed – likeability of the ad.